1903 springfield very low serial number # 7 help identification ? Thread: 1903 springfield very low serial number # 7 help identification ? Plz ! help me to identify my 1903 springfield very low serial number # 7 ??? It's hard to tell from the pics but that looks to be simply very worn markings. I do not believe the complete serial is visible. If it was a single digit, that digit would be centered. Take a photo of the serial number with the camera not centered directly above it - so the shot is on an angle. Photo software can help tease out more of the SN. It may be worth trying the old 'pencil rubbing' trick also. It's hard to tell if there is more there or not. The focus in the area of interest is not too good. Even the 7 is difficult to make out. Edit: It will take a really good photo of the area to try to tease some info out. A snapshot likely won't do it. Last edited by boomer656; 08-20-2018 at 12:34 PM. I believe it to have had a longer serial number and the 7 is the only digit still visible. Just do a google search for 1903 Springfield serial 1 and you will see many single, double, and three digit receivers to compare it with. Last edited by cplstevennorton; 08-20-2018 at 05:35 PM. Any more information on serial number 91 ? I agree, it's not in the place a single digit should be. Looking at the OP's first pic blown up it appears to be 2 digits very very faintly prior to the seven a possible 3 then a 2 (237) thats about my best using a blowm up pic and a mag glass on the screen. You could also use chalk to try and highlight it would engineers dye be of any use guy's. the OPs serial has 3 digits or did..
and looks to have been cold blued at some point. warpath metal finishing contact info. 720-841-1399 during normal bus, hours. 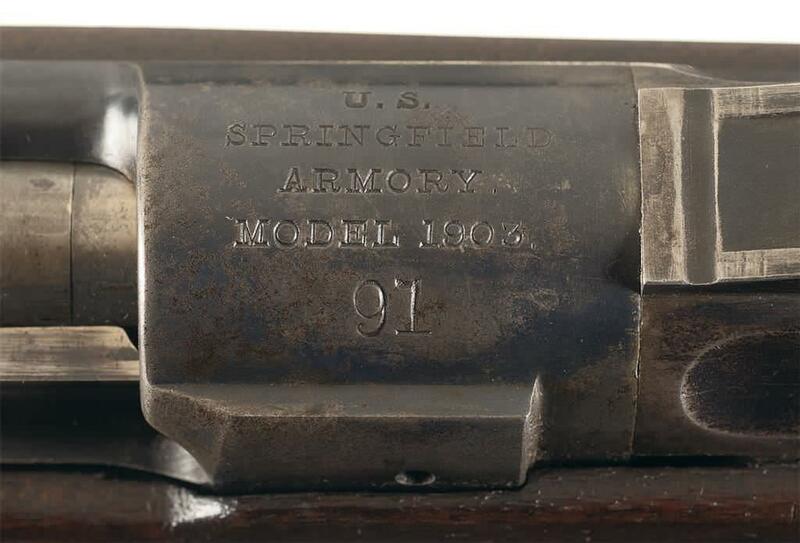 Is your M1903 Springfield Serial Number Here?